Demand for packaging of pet care products is expected to continue its growth. As consumers become involved in their pets’ wellbeing, Elif continues to offer new packaging solutions for pet care market. Elif’s laminated packaging films and pre-made pouches provide improved packaging functionality, reduced spoilage, improved odour control and opportunity for enhanced graphics. While biodegradable and recyclable packaging materials like ElifCare match consumer demands for more sustainable packaging in pet food, the market has also shifted the type of aesthetic appeal of its packaging. 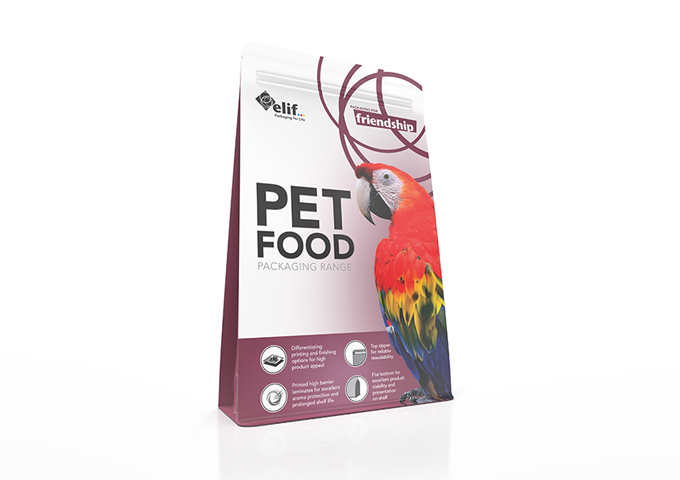 Matte and partial matte finishes, special materials like ElifFine and printing solutions like ElifHolo are some of the solutions offered by Elif for appeal demanding pet food industry. Consumers also demand convenient packaging solutions when it comes to their pet food, especially for the ones in big sizes. Elif uses different types and sizes of pouches for pet care sector and offers zippers, tear notches, different types of handling features, closures and fitments.